Frank Chowns was born in Moreton in 1883 the second of four sons and one daughter born to William and Emma Chowns. He married Rose Squires at St Mary’s Thame on 16th September 1905 when he was living at 13 Bell Lane, Thame. remained in Thame with his new wife. 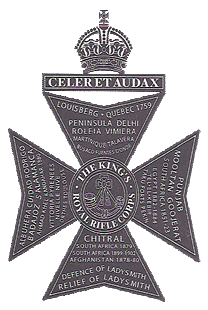 Frank joined The King’s Royal Rifle Corps in April 1902 and served with them in South Africa from 1902 to 1904, following the Boer War He was transferred to the reserve in 1905 and it would appear that he was re-called on 28th November 1914 and was in France a day later. 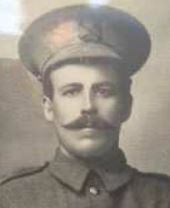 The family story that has been passed down says that on receiving the news of his call up his wife Rose took his kit bag down to the farm where he was working and from there he departed for his regiment. Frank was killed whilst fighting with the 2nd Battalion The King’s Royal Rifle Corps in the Battle of Aubers Ridge on the 9th May 1915. The 2nd KRRC were in a support role at the southern end of the attack at Richebourg, close to Le Touret. 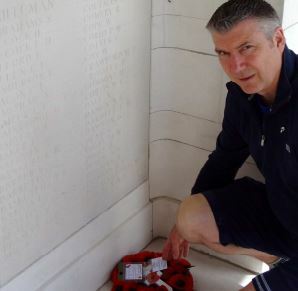 His body was never found and so his name is recorded on Le Touret Memorial, Pas de Calais, France. He is remembered in Thame on the war memorial and on All Saints and St Mary’s memorial boards, and on Rose’s parents gravestone in St Mary’s church yard.